FRIDAY IS HERE AND IT’S TIME FOR THE SILVERBACK BUFFET. ANY WORKOUT FROM THIS WEEK OR CATCHING UP ON YOUR GORILLA FIGHT. LET’S GET THIS SHOW ON THE ROAD. 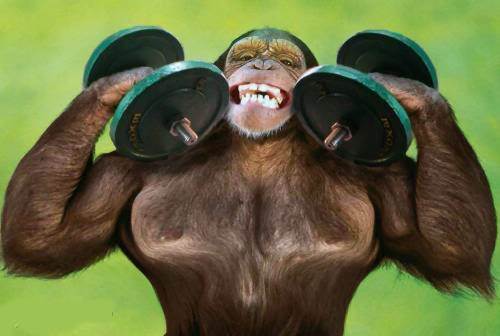 All the concentration curls and dumbell flies in the world will NEVER MAKE A CHIMP A SILVERBACK! One of the things I like about this “box”- when someone sees you struggling and they have already finished their WOD. They are willing to join you in yours and encourage you to finish. Other also give you a “Keep going” as they pass by. It was a long 7 rounds, but couldn’t have done it without ya’ll. Big Thanks! Two more weeks with the pins…. 🙁 Dr. said he could pull them today, but I would not be able to go anywhere near the box for 3-4 weeks if he did. So as a precaution he left them in for another two weeks. Ok, so I got 2 less reps on 12.5 than last year. However, I did the WOD with 25 more pounds than last year. So, If I did the math correctly that’s 2000 more pounds than last year in the same amount of time. I’ll take it!